What is the most popular choice for people looking for reliable and secure cloud storage? There are several serious players on the market like Google Drive, OneDrive or Dropbox. However, more and more people are looking for better alternatives. How so? This happens because the giants often ignore the elementary privacy rules. We cannot say for sure that our files are completely protected, no matter what they say. Is there any good alternative? Yes, there is. Let’s take a closer look at pCloud. This is one of the youngest companies on the market. However, they have the opportunity to build credibility and earn the trust of millions of users around the world. 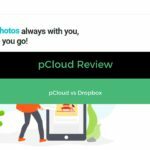 In this review, we’ll see why pCloud is so good and how it can be even better than the key market players. Does pCloud work with iPhone, Android & Desktop? Is pCloud Safe and Secure? pCloud is a young and very promising cloud storage provider with the headquarters located in Switzerland. The company managed to gain good feedback from both professionals and common users in a short time. The developers initially stated that their service was intended equally for business and private individuals, and therefore they did their best to make it very convenient for both. The technical side of the service allows even ordinary customers to enjoy all the benefits of storage and not feel disadvantaged in any way. 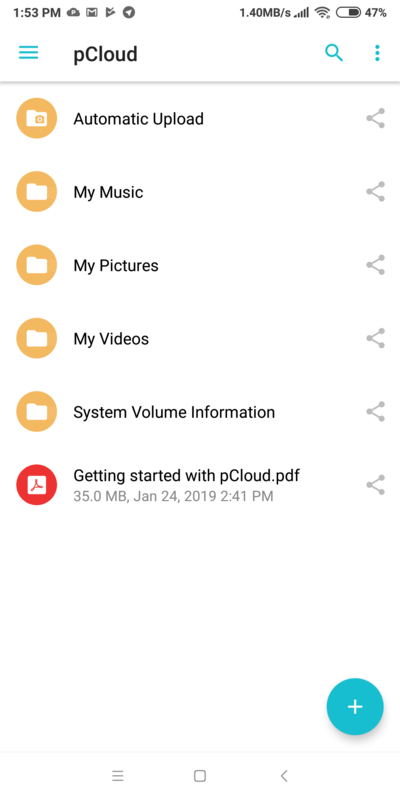 While other similar file storages unnecessarily complicate their services, pCloud tried to focus on making the cloud storage as convenient as possible. At the same time, the service provides really rich functionality. Having started its work in 2013, pCloud managed to attract more than 6 million active users and their number is constantly growing. 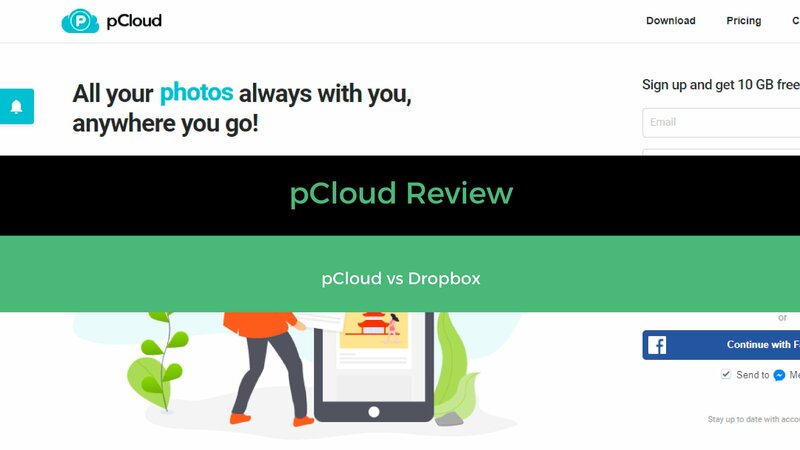 The pCloud team believes that it is very important to reliably protect all the personal data you store in the cloud storage. That’s why they provide the unique feature called pCloud Crypto. That is the most reliable unbreakable file protection. How does it work? All the files are encrypted on your device before being uploaded to the remote server. You will not lose your data even if someone steals your device and no one will be able to access your files, not even the pCloud support. The encryption algorithms are absolutely secure. However, activating the feature requires additional payment: a monthly subscription of €4.99, an annual subscription of €47.88, or a lifetime subscription of €125. restore the files from the trash bin up to 30 days after removal. Most cloud storages have a lot of different limitations. They may include limited file size or limited download or upload speed. Such limitations cause some sort of discomfort and users have to look for better solutions. What about pCloud? This cloud storage does not have any limitations such as the maximum file size and the upload and download speeds. So, you will be able to store files of any size, not bigger than the available file storage, of course. Also, the connection speed will be limited only by your internet service provider. You will be able to configure the maximum speed in the application menu. Do you regularly work with your files and often change them? Maybe you need a previous version of the file? No worries, this is available for you. You are able to track the changes you made to the specific file and restore the previous version for up to 30 days since the last activities. Also, the user is able to restore the file up to one year after deletion. pCloud provides attractive prices and an easy procedure of registration. If you do not have an account yet, go to the homepage and select the Create Account feature. There are several options: you can register using your email address or use the one-click registration using your Facebook account. We preferred the second option. If you are already logged in into your Facebook account in your browser, the system will automatically detect your account. Having clicked on the Continue with Facebook button, confirm linking your account and agree with the service rules. All the process will take literally only a few moments. Several seconds later, you will get an email notification and a message in Facebook Messenger. That’s all, your account is ready. You will be able to download the desktop application or continue with the web interface. 1 GB for each invited friend or family member. If you run out of free space and need more, get a paid subscription. The prices are affordable and more attractive than those of most competitors. There are two major tariff plans: Premium and Premium Plus. The first one gives you 500 GB of storage, while the second offers 2 TB. You are able to pay for your subscription monthly or annually. Of course, if you choose an annual subscription, you will save 20%. Moreover, pCloud is the only cloud storage provider offering the option to get a lifetime license. At the moment, the company offers a great discount of 65%. The family plan allows sharing the storage space between 5 family members. You can allocate the necessary amount of memory for each of them. How can you pay for the subscription? They accept bank cards, PayPal, and even Bitcoin. So, again, the company proves its approach to protecting the privacy of its users. Using Bitcoin, you are able to remain anonymous. The transaction is absolutely secure and safe. To be the best service, pCloud supports almost every possible platforms. It has a web application, a desktop app for Windows, Mac OS, and even Linux, as well as mobile apps for Android and iOS, a browser extension for Google Chrome, Mozilla Firefox, and Opera, and a Lightroom plugin. So, you can literally use it on any device. Now, let’s take a closer look at the features of each platform. You are able to access all your files using the web interface. pCloud is available for any modern browser. It has an attractive interface and provides all the necessary details about your profile and files. In addition, it includes a convenient audio and video player. On the main page, you will see all the folders and files. On the left, there are the links to the most important features. On the right bottom corner, there is an uploader window where you can control all the files being uploaded. At the top, the system will provide the necessary steps to get additional space. So, you can browse files, access public folders, save previous versions of the files, see the trash folder, and other features. Another great thing is the backup of other cloud storages. You are able to create a backup copy of your files on Google Drive, Dropbox, OneDrive, Facebook, and Instagram. This feature is especially useful if you are not sure about the security of your files stored on social networks. 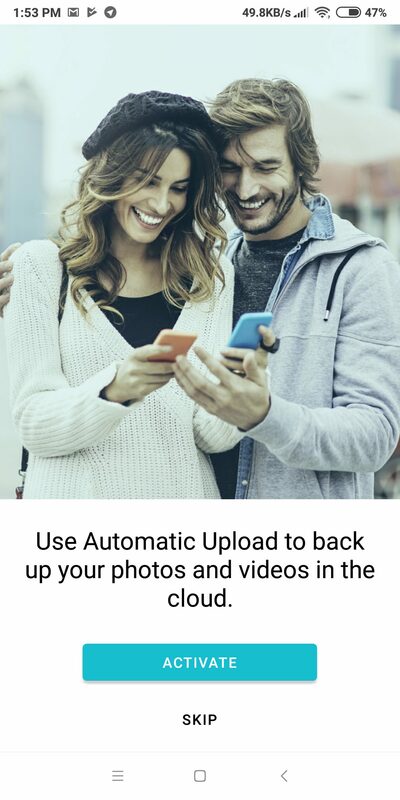 To create a backup, all you need to do is to connect the account you want to back up with just a few clicks. This is a unique feature which allows you to access your cloud storage as if it were a local drive. When you install the application on your desktop PC, it will automatically create a virtual disk and assign a letter to it. By default, it is P.
However, you can easily change this in the operating system settings if you like. How does it work? The system will see it as a common local drive. You will be able to easily save the files you want to back up on the cloud storage and they will not take any space on your hard drive. To access the files, you will require an Internet connection. At the same time, it is the easiest way to expand your storage capacity. How? The size of your pCloud can be up to 2 TB and usually, this is much more than what an average computer has. What features does the desktop application have? We will review the app for Windows, but it is practically the same for Mac and Linux. First, you have to download the app from this page and install it. Agree with the terms and conditions, and run the app. After that, log into your pCloud account. Enter your email and password or continue with Facebook. If everything is correct, you will see the virtual drive in the file manager. The app menu is divided into several tabs. In the Account tab, you will find the information about your account, tariff plan, and the link to the web version and trash bin. In addition, you can change or restore your password, upgrade the subscription or unlink your account. 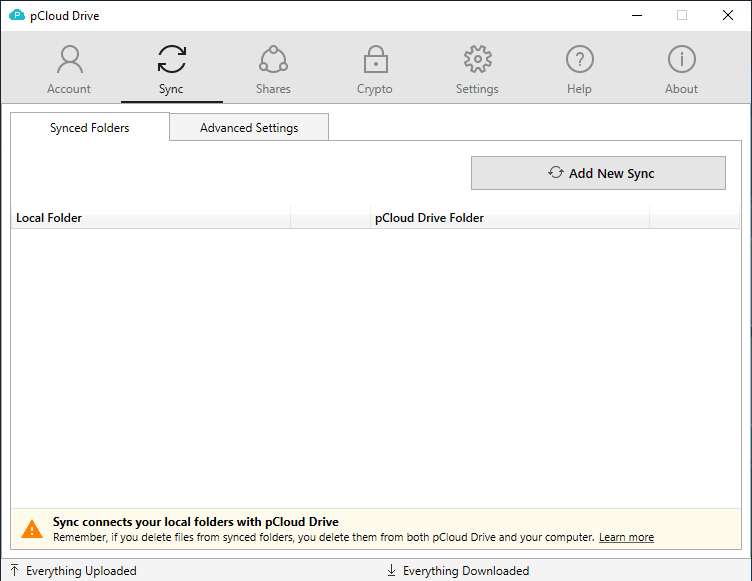 In the Sync folder, you will be able to add the local or pCloud Drive folder for synchronization. This is especially useful for documents or very important files. If your storage device fails, the files will be protected and stored on the pCloud servers. In the Shares tab, you can select the folders to share. Depending on the settings, others will be able to download the files you shared to their hard drive or upload their files to your folder. In the Crypto tab, you will be able to activate the pCloud Crypto and then apply necessary settings. The next tab is Settings which is divided into General, Speed, and Disk Usage tabs. 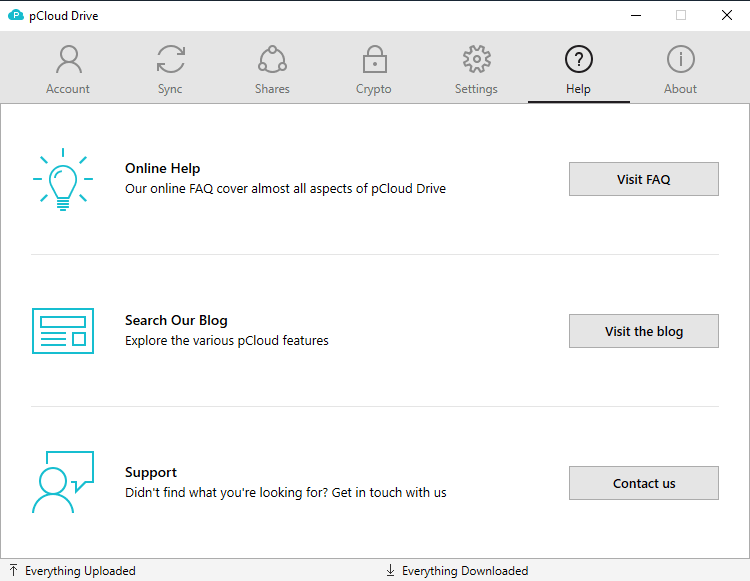 Here, you can configure the pCloud Drive app: change the language, configure the upload and download speed limits, as well as the maximum disk space on your hard drive. The configurations are not extensive so it will be very hard to break something. The last two tabs will allow you to get online help, contact the support team, check the information about the installed application, and get updates. To access the app settings, use the context menu. In addition, you can configure the notifications, open the drive, or pause the synchronization. 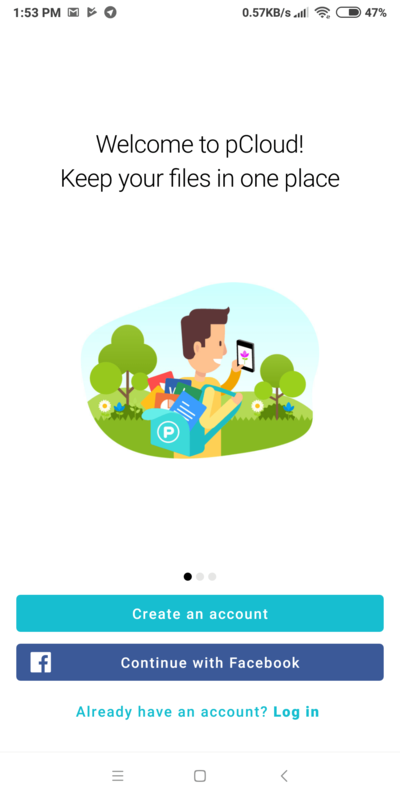 pCloud Provides beautiful mobile apps for Android and iOS. In this article, we will review the app for Android. The iOS version is very similar and has the same options. To install the app, find it in the Play Market or App Store. It is lightweight and for Android 8.1 it takes only 11 MB of memory. Having launched it the first time, log into your account or create a new one. As we created our account using the Facebook login details, we selected the Continue with Facebook button. It took one or two seconds to log in. Next, the app requested to activate the automatic upload. Of course, you can skip this step. We activated it, as it gives 1 GB of available space for free. After activation, the app will automatically upload all your media files. The app menu is very easy to use. It is intuitive and user-friendly. When you open it, it displays the root folder with all the files. To access the menu, swipe to the right. The menu includes Files, Crypto Folder, Offline files, Shared Folders, My Links, Notifications, and Settings. In the bottom corner, it displays all your active uploads if there are any. You will be able to view all uploaded files in the Automatic Upload folder. The app creates a sub-folder named after your device. As you can see, we tested it on a Xiaomi Redmi 5 Plus — the folder has its name. However, you are not able to choose specific folders for synchronization — it will upload all your media files. In some cases, it can be good but mostly this not so necessary. In the settings, the only thing you can specify is whether you would like to sync all files or just the newly-created ones. Also, there is a problem with the Android app. If you exit the app by killing the process, it breaks the automatic upload. What does this mean? Many manufacturers such as Xiaomi, Huawei, and some other companies, mostly Chinese, provide their own Android-based firmware. To optimize the system, they can kill the apps working in the background. When you quit the app this way, the app will not automatically upload the files. To restore this feature, disable and then enable it again in the settings. In the Settings tab, you can configure almost anything related to the application and your account. All the settings are grouped and can be easily accessed with a few taps. Invite to a folder. 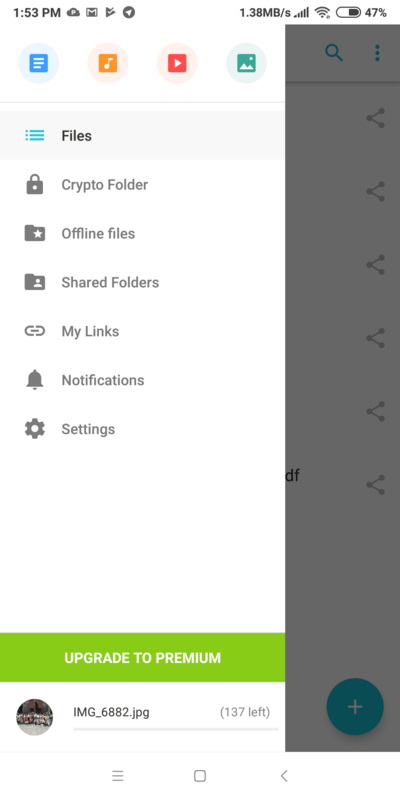 Create a link to the folder with files and share it with your friends, family, and They will be able to view or edit the content, depending on the settings. This feature is available on any platform. Download and upload links. 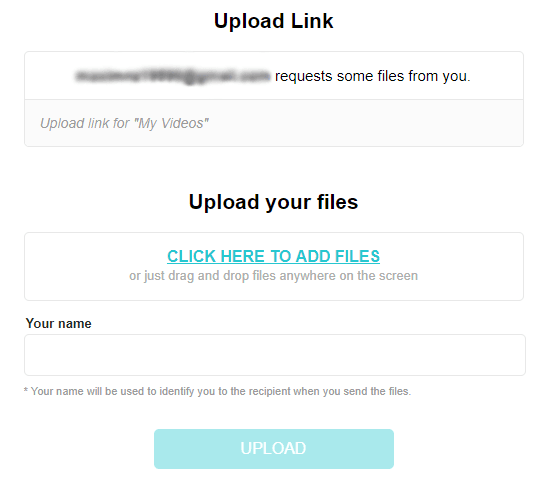 By sharing the download and upload links, users will be able either to download the files to their computer or upload their files to your pCloud account. They don’t even have to be pCloud users. Direct links. This feature allows using your account as a hosting service for images, HTML pages, and other files, as well as easily sharing them with other people online. To avoid data loss on your devices, pCloud offers the synchronization and backup features on multiple devices. This means that you can use an unlimited number of devices with one cloud storage account. 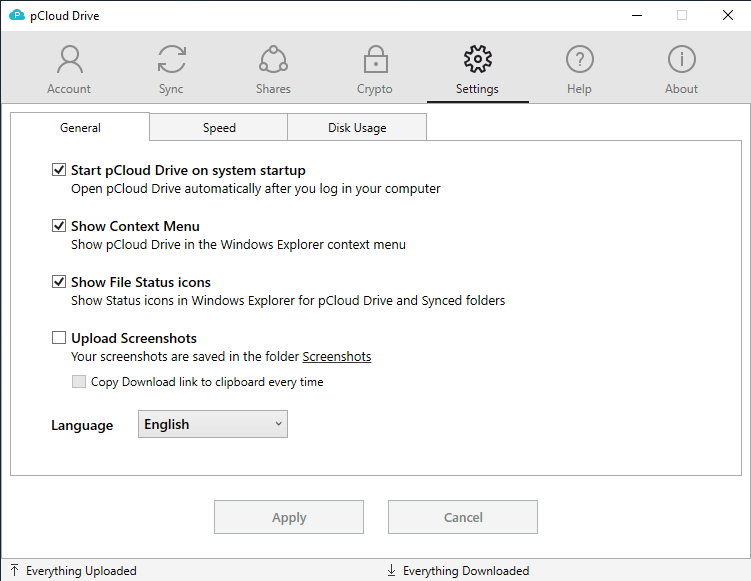 The application will constantly synchronize the files between the devices and the pCloud Drive desktop app will do it automatically and act like a local drive. On mobile devices, the Automatic Upload feature will back up your files. In the settings, you will be able to configure whether you want to upload all media files or just the newly created ones. 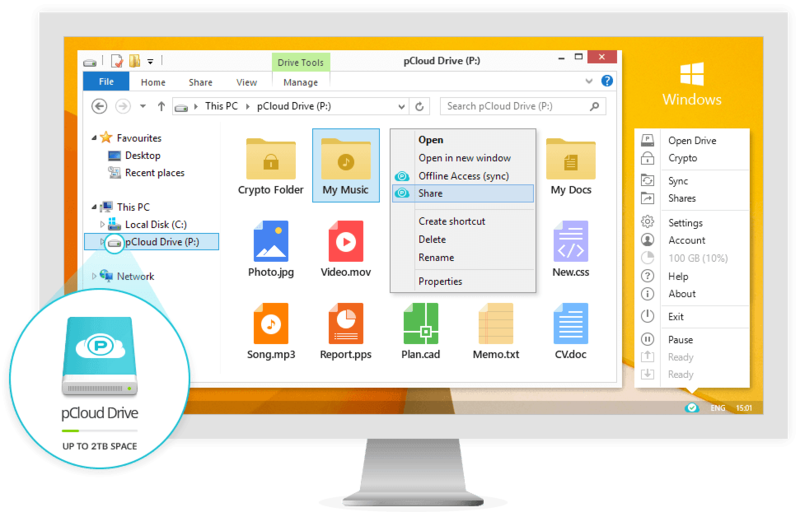 pCloud is one of the best cloud storages to work with media files. Very few competitors offer the same rich functionality. What do these capabilities include? Let’s start with the web app. You are able to view the images in thumbnails or in list view mode. In addition, you can view the pictures in a slideshow and change its duration, as well as download them with changed resolution. It is the same for videos. In addition, you will be able to watch them right in the browser or stream them in the mobile app without downloading. As for music, pCloud is the only service allowing to build playlists and playing them online. The upload and download speed is the key factor of each cloud storage service. More and more users have access to a speedy Internet connection, that’s why it’s logical that they want to work with their files at the highest speed possible. At the same time, it is the hardest thing to achieve, especially for companies with limited server infrastructure. Despite being based in Switzerland, pCloud has the only data center located in Dallas, Texas, USA, making it obvious that it will work faster for the users from North America than for Europeans. When doing this test, we are physically located in central Ukraine. Our Internet service provider offers the connection speed of up to 50 Mbps. It is enough to download or upload a 1 GB file in about 3 minutes. We did 2 tests. First, we uploaded one video file of 1.2 GB and downloaded it back to the hard drive. Second, we uploaded a folder consisting of different files with a total size of about 1 GB. We can see that uploading the files via browser is a bit faster than via the pCloud Drive app. We cannot explain why this is, but it is obvious. 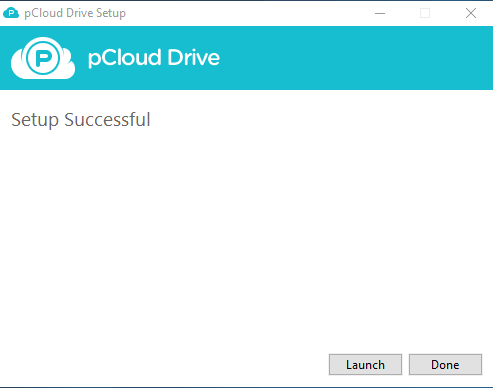 Another interesting fact is that downloading files using the pCloud Drive works like copying the files from a local disc. As a result, it is much faster than using the browser. We must acknowledge that in general, pCloud is indeed a fast cloud storage system. To reliably protect your data, pCloud uses TLS/SSL encryption while transferring the files to the remote servers. Also, they store all your files on at least 3 server locations in the highly protected data center. The pCloud Crypto feature encrypts the files on your device and no one else will be able to access the decryption keys. For the best encryption results, pCloud encrypts all the personal files before uploading them to the server. So, they store already encrypted files. Due to the zero-knowledge privacy, the encryption keys are not stored on the servers so, no one can read your files. 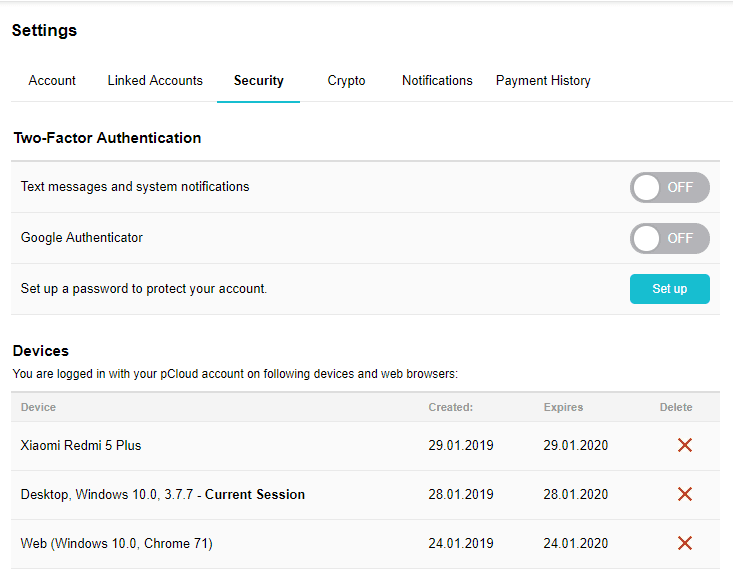 pCloud is the first service to provide both encrypted and non-encrypted folders in the same account. The user is able to select the files and folders to encrypt. pCloud uses 4096-bit RSA for users’ private keys and 256-bit AES for per-file and per-folder keys. They use several ways to decrypt and encrypt files for better and more reliable results. At the moment, pCloud technologies are considered to be unbreakable. The Technical Support is available only via email. 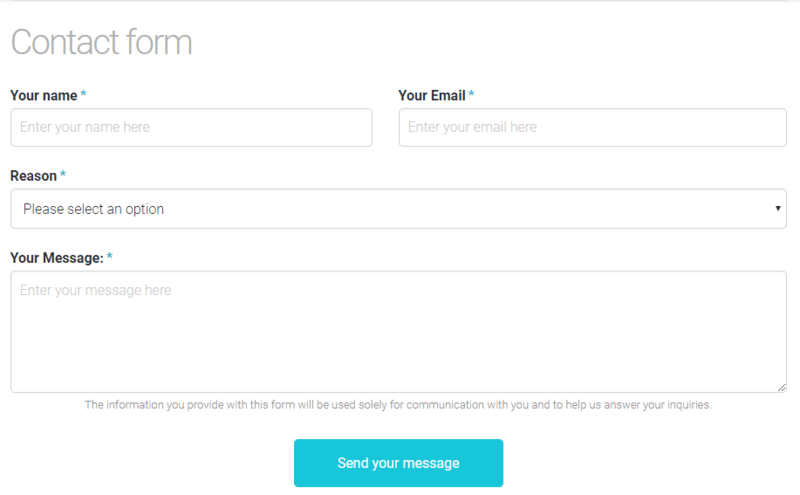 To contact them, send a message to [email protected] or fill in an online form. How to find it? Click on the profile picture and then select Help — Request Help or just Contact. I have an issue on my Xiaomi Redmi 5 Plus smartphone. When I quit the app killing the process and run it again, the automatic upload doesn’t work. I have to disable it and then enable again in the settings. There is no such problem, for example, in the OneDrive app. It took too long to get a reply. We are sure they must respond faster. In addition, they did not provide any practical help and could not help with our problem. Of course, it doesn’t mean that Technical Support is bad. However, it is obvious that there are areas where they should definitely improve. This feature is available only for the desktop app. Find the folder you would like to sync, click the right mouse button, and select Sync to pCloud. The synchronization will start immediately. Another way how to do that: open the pCloud Drive preferences, select Sync — Add New Sync — Choose Local Folder — Add Sync. The application will synchronize all the files in that folder. Invite to Folder — share the link to the folder to collaborate with your family and colleagues in real time. Add the email addresses in the popup window and send an invitation. Download link — with this link, the users will be able to download the files from the folder to their devices. In the popup window, copy the link or add the email addresses. Upload link — with this link, the users will be able to upload files to the folder from their devices. It is a very useful feature when you want to create an archive from some event, for example, from a party, excursion, or trip by adding the pictures and videos of every participant. In the popup window, copy the link or add the email addresses. pCloud Drive. In the file manager, select the folder and choose the required option. Keep in mind that there is no popup window when choosing a download or upload link. Mobile. In the pCloud app, select the wanted folder, mark it, tap on the share button, and select the necessary option. Open the link in your browser. Select the files and type in your name. You can manage the devices you use with your pCloud account. 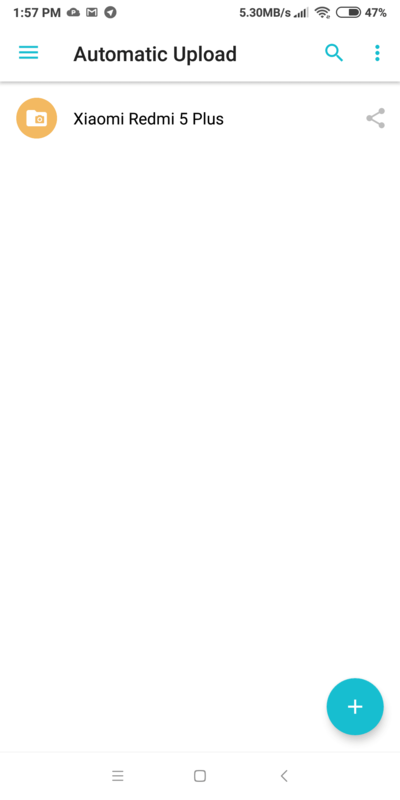 For that, open the web version of pCloud, click on the profile picture and then select Settings — Security — Devices. You will see the list of all the devices connected to the account. If you want to delete any of them, click on the red cross. Dropbox is one of the industry leaders, it was launched more than 10 years ago. Can pCloud be a good replacement? Let’s make a quick comparison of both services. We uploaded and downloaded the same video file of about 1.2 GB via a browser. It took us 4 min 30 sec and 3 min 47 sec respectively. So, the upload speed is a bit slower while the download speed is significantly better. Most likely, this is because Dropbox has much better server infrastructure. Both services provide great protection. However, only pCloud offers pCloud Crypto — the full encryption mode before sending the files to the servers. The biggest advantage of this technology is that no one else can access the files as they are reliably encrypted on the device. pCloud offer two subscription options: annual and lifetime. 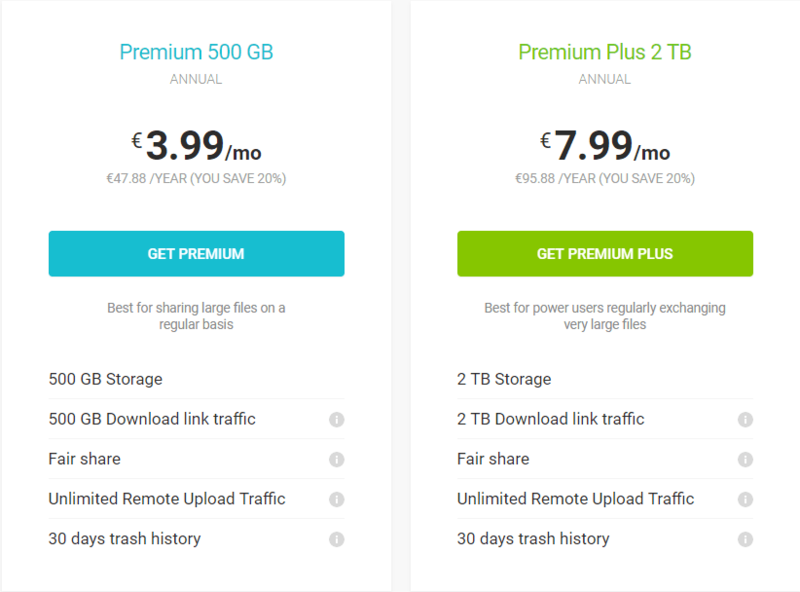 You can get 500 GB for €3.99 per months and 2 TB for €7.99 per month. The same volumes are available for €175 and €350 respectively per lifetime licenses. In turn, Dropbox offers annual and monthly subscriptions that cost $8.25/$9.99 per 1 TB and $16.58/$19.99 per 2 TB respectively. 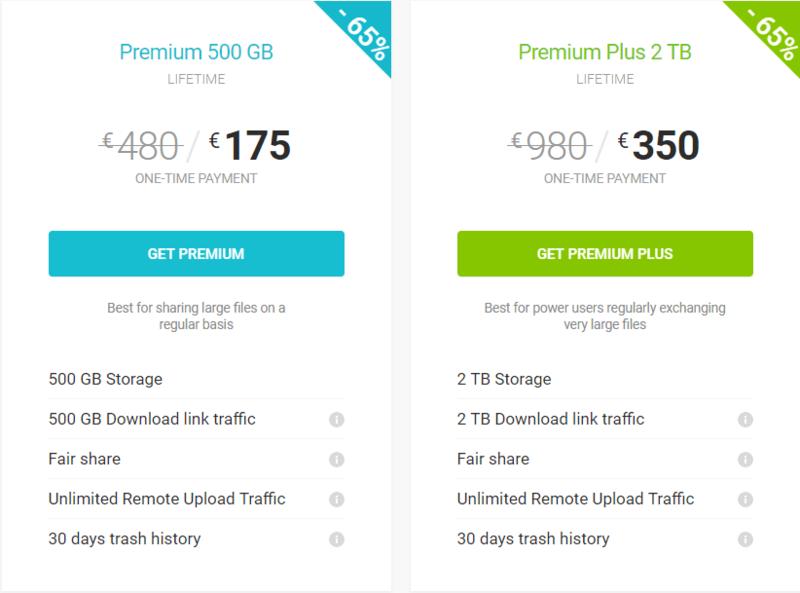 Not being a worse service than Dropbox, pCloud has much more attractive prices. pCloud is the overall winner with a score of 2:1. Fast upload and download speed. Virtual local drive to access the files without using the device memory. Additional payment for pCloud Crypto and Extended File History. Do we recommend pCloud? Yes, we do. Try it — we are sure you will not regret your choice. 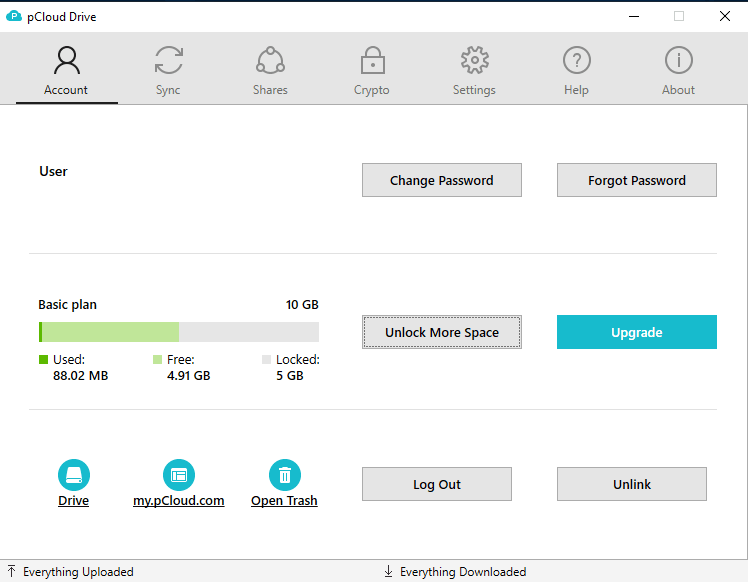 Get 10GB Free Cloud Storage With pCloud!